Times: Daily 11:00, 12:00 & 13:00. (no trip on: 24-26 Dec, 31 Dec). Pick Up: From your hotel or a convenient point in the city centre. Clay pigeon shooting brings out the competitive nature in everyone. It is a sport in which there's nowhere to hide, but with a bit of concentration you can feel your skills developing in just one session. After picking you up from your Prague hotel, we drive 40 minutes through Prague and into the picturesque Czech countryside to the clay pigeon shooting club. 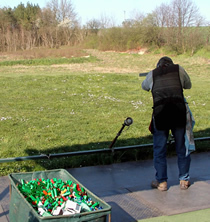 Full on-site training in English is given at the start of the activity by an ex-Czech Olympic team trainer, including safety instruction and advice on how to use the gun effectively to hit moving clay targets. Clay pigeons are launched from electronic voice activated traps, and up to 6 participants can shoot at any one time. Each person gets 50 shots at 25 clays. Competitors get a marked score sheet, with a diploma presented to the winner. In between shooting, you can observe the rest of the group from outdoor observation decks or from the rustic wood panelled clubhouse, which serves snacks and drinks. A light lunch is laid out in the clubhouse and is included in the price, together with a beer at the end of the shooting. Prague Experience group activities include return transport by taxi/minivan/coach, all necessary equipment and instruction, and an English speaking guide where appropriate. Note: Participants undertake this activity at their own risk and will be required to sign an injury disclaimer. Insurance is not included - you are advised to arrange this through your travel insurance company. Just yourselves - equipment is provided. Advance bookings are essential. Group activities are very popular, so should be booked before your arrival in Prague. Book this activity and get a free party pack containing drinks vouchers and a party map: more info. From £66/ €74/ 2034 CZK per person. -Return transport from your hotel. -English speaking guide & instructor throughout.